Okay…just a super quick and easy card for the CAS (clean and simple) challenge on SCS today. The challenge is a day at the beach. Hmmm…what to do? I really like the Sea Street set but usually only use the cute octopus in there. Yet there are all these other FUN images…little mind you…but perfect for ‘a day at the beach’. Stamp ‘rope’ using Crumb Cake, cut out and add to card front. Stamp greeting using Night of Navy. 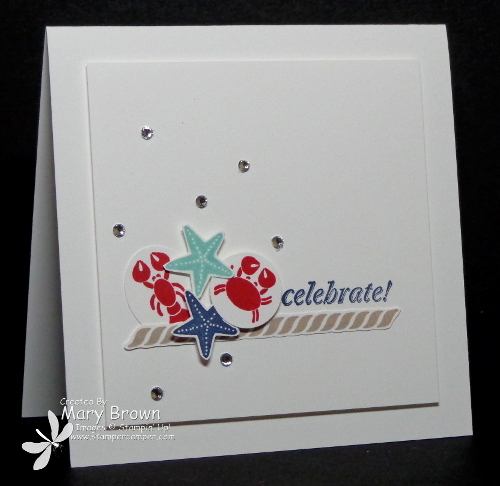 Stamp star using Night of Navy and Pool Party cut out. Add dimensionals to the back of stars and crab and add to card front. So…that’s my quick and easy, clean and simple card! Time for bed! This entry was posted in Challenge, Clean and Simple (CAS) and tagged And Many More, Sea Street. Bookmark the permalink. Love this card, colours fit so well. TFS.